Ah, autumn. When the trees turn red, yellow and brown. When the weather cools to a crisp Ishouldhavewornajacket-ness. When students keep turning in the papers I assign, and I keep being forced to grade them. And, apparently most importantly, when pumpkin spice is a thing. Doughnuts. Coffee. Beer. Crackers. And although I haven’t been to Staples recently, I suspect pencils. I get it. I do. We all appreciate pumpkins. We all anticipate dressing up as Agent Melinda May and waiting for the Great Pumpkin in our local organic-certified sincere pumpkin patch (okay, admittedly, I am speaking for myself here). And we all just loooove our allspice. This entry was posted in inspiration, popular culture and tagged Agent Melinda May, autumn, Great Pumpkin, Halloween, pumpkin spice. Heh, just wait until all the commercial crap starts arriving on the shelves at Midsummer! I agree. 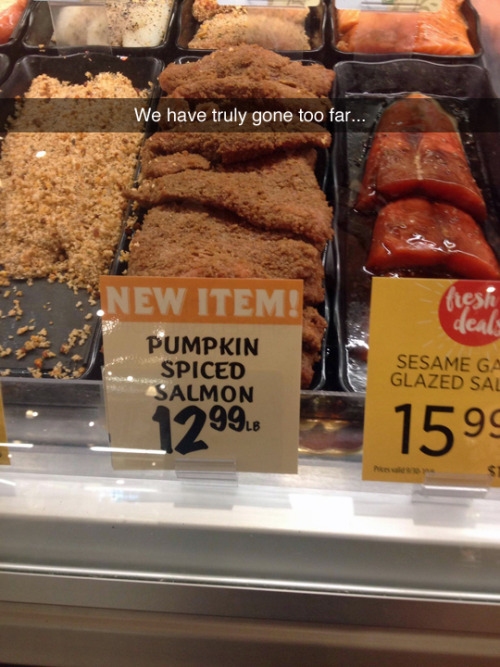 Enough with the pumpkin spice! !